Posted on August 4, 2010 under Travel. We had an early morning flight to Leh on Kingfisher Red. The flight left on time, and we were on the last leg of our journey to Leh. 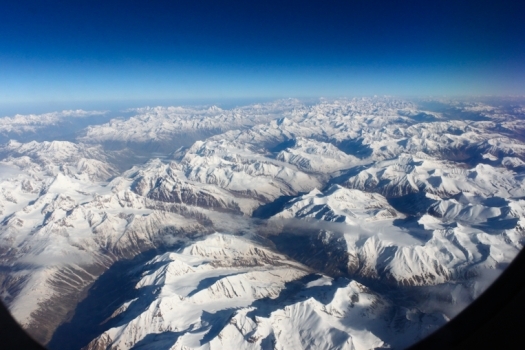 Quite soon, everyone on the flight was taking in the sights of the majestic mountain ranges towering below the plane. In about an hour and a half we began our final approach to Leh. At the airport we were met by the representative from our hotel. After a short ride, we were shown to our rooms at the hotel. The manager at the Hotel advised us to take the day off and rest at the Hotel. Leh, is at an altitude of about 3500 m above sea level and one needs some time to get acclimatized to climate there. As expected though most of us were badly affected by the acclimatization process, with the usual symptoms of headaches, mild nausea etc. However, given that we would start our first day trip on the next day we were all in very good spirits.